When I play using PS3 on my old simple TV because of the high or low resolution it does not appear clearly. How do I change the resolution of PS3 to achieve a clearer display? This guide from Sony has what you are after. If you changed televisions or changed the type of cable you are using, you may need to reset the video output on the PS3. Perform the following steps to reset the Video Output Settings. Before changing cables, make sure the PS3 is turned off and the power light is red. Unplug the power cord of the PS3 and television (or display) from the wall socket. Make sure the HDMI cable is connected to the [HDMI OUT] port on the back of the PS3 system. Connect the other end of the HDMI cable into the [HDMI Input] port of the TV or display monitor. Plug the PS3 and television (or display) back into the wall socket. While the PS3 system is in standby mode (red light on the front of the system), hold down the On/Off button on the front of the system for at least 5 seconds until you hear a second beep. 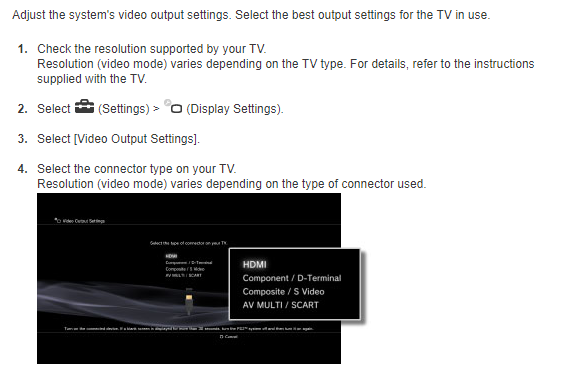 The Video Output Settings will automatically reset to the standard resolution (or detect the current display output settings of your TV/monitor). This part came from here. How can I transfer ownership of a PS3 account? Why won't my PS3 connect to my Sony monitor?